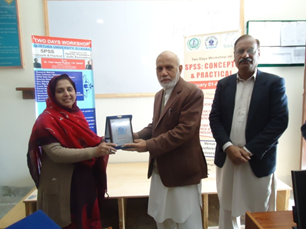 A Two-day Workshop on “SPSS: Concepts & Practical” was held on Feb 01-02, 2018 at Qurtuba University DI Khan. The workshop was organized jointly by PASTIC Peshawar, Gulls Association Pakistan & Qurtuba University, DI Khan. The workshop aimed to give assistance to research students to understand and interpret the data obtained from their survey questionnaires. 55 Research students, from the Departments of Management Sciences, IT and Engineering were present to do hands-on and detailed inputting of data through SPSS. The resource persons Dr. Yasir Hayata Mughal and Dr. Ismail discussed the following topics: Introduction to Sampling and Designs, Inferential Statistics, Test on One and Two Sample Means, Chi-square Tests, Non-parametric Tests, Inferential Statistics and other advance topics. The students were encouraged to raise their queries about the derived data from their research outputs. Prof. Dr. Hameedullah Khan Alizai (Vice Chancellor, QURTUBA University) graced the Opening and Closing sessions of the event and appreciated the efforts of PASTIC. 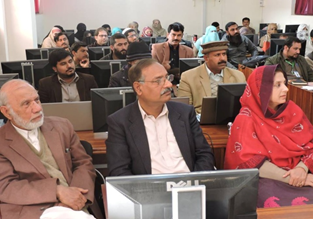 The Vice Chancellor & Registrar Qurtuba University and & Dy Director PASTIC Center, Peshawar during training session. VC QUIST Presenting Shield to DD PASTIC.